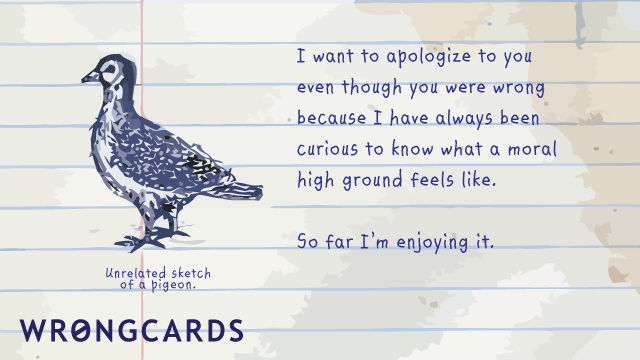 “Taking the moral high ground” is an expression you might hear used in discussions about controversial topics where ethics/morals play a role. I realize that a discussion about different baseball teams or the advantages of certain cars over others can be controversial as well, but the opportunity to take/claim/seize the morale high ground are less abundant in these situations. And that, I might add, despite the fact that this position might not be the most personally advantageous one could possibly take. The phrase implies a critique of other, less moral positions and a person who takes the moral high ground may come across as a bit of a snob. In 1972 the comedian George Carlin defined seven “dirty words” – offensive or indecent words – that could not be used on TV. To this day most of the words on Carlin’s original list remain taboo on American television and are bleeped out should they happen to escape somebody. What these seven words are I leave up to your imagination or the power of a Google search or – as a shortcut – the clicking on the following link. If that was it, this wouldn’t be much of a post but things have become a little more complicated as new “dirty words” in the second sense of the word – namely ” things regarded with dislike or disapproval” – are added all the time. Good old terms like “government” and “liberal come to mind. I thought of this as a rather recent development but at least for liberal I found an article complaining about this 10 years ago (here). It is still quite unclear to me how liberals could let that happen, especially considering the definition (type define Liberal into Google) “Open to new behavior or opinions and willing to discard traditional values.” – who wouldn’t want to be that? And who would want to be the opposite (that would be conservative then): “closed to new behavior or opinions and unwilling to let go of traditional values”. Government as a dirty word goes even further back, it has it roots in the 60s but the person who made this way of thinking popular was Ronald Reagan in the 80s. Here is a NPR article about this topic. The worst of all dirty words appears to be atheist. But that is a long story and deserves a separate blog post. Here is another useful and not intuitive expression I have heard on occasion: “about face”. When I first heard it I had no idea what it meant also, once one knows the meaning of this expression it is a little less unintuitive. So an “about face” is he act of turning around by 180 degrees so one faces the opposite direction. The expression comes from the military where it is used as a command to get the soldiers to turn clockwise (I guess it is important that everybody turns the same direction) by 180 degrees. In “civilian” language the phrase is used to indicate a complete change in view point or opinion. As such the phrase is often use in connection with politicians. 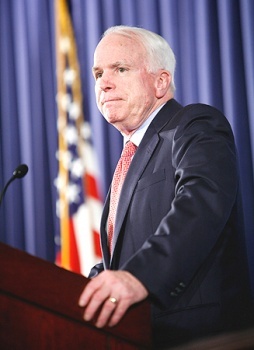 One famous (or rather infamous) example is the about face of the republican nominee for the last presidential elections, John McCain, on immigration issues. McCain used to be bipartisan and fairly moderate on immigration, defying many of his hard-line republican colleagues – these days he is an uncompromising hardliner himself. An about face does not have to be negative. In its best incarnation it implies that somebody learned something and as a consequence has changed his/her position. In a negative case, like the one mentioned above, it means that somebody caved in and has adopted the opposite position because he/she expects to benefit from it. Scientist among you know litmus tests as simple and easy tests to indicate the pH, i.e. a test lets let you test a liquid and decide whether it is acidic or basic/alkaline. 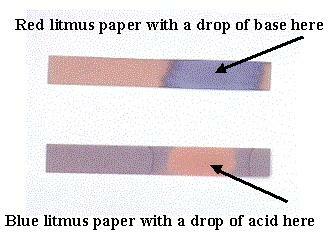 Blue litmus paper turns red under acidic conditions, blue under alkaline ones and purple if the solution is neutral (pH 7). Where am I going with this, this is not a Science 101 blog. Right, so lets turn to the figurative usage of the term litmus test in politics. There a litmus test is a question asked of a candidate that shows his or her opinion on a certain – often controversial – topic. Depending on the answer to such a Litmus test question the voters/those who approve the nomination of the candidate might choose to support the candidate or to withhold that support. Litmus tests are frequently used in American politics – be it expressedly stated or not. Candidates for any type of higher office face them and especially judges. Here are some examples: for many conservatives abortion is a litmus test, if a candidate for office is pro-choice he/she failed the litmus test and will not be supported by the majority. Gun control is another such litmus test for conservatives. If a candidate is for gun control chances are slim he’ll/she’ll be a conservative politician. I read a blog at the Guardian the other day which made an interesting observation that I think is worthy a mention here. The claim was the following: if you want to call something bad in the US but can’t quite put your finger on the exact nature of the badness just call it “European”. 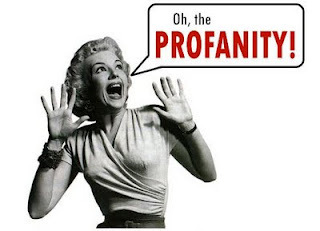 People using strong language say “excuse my French” as if the French were particularly prone to obscenities when in fact the Americans have a pronounced fondness of the f-word, even if it is bleeped out on TV. People against health care reform carry on about the risk of Europeanizing the country – as if that was the end of the world as we know it or a head first plunge into Marxism. Senator McConnell (a Republican) just recently warned that the health care reform plan will turn the US into Western Europe. He said this not in support of the health care plan (which all Republicans are opposed to as a matter of ideology) but as a scathing damnation of Obama’s health care reform – and everybody understodd it to mean that, no explanation required. Nobody even seems to feel the need to explain how health care for unemployed and children should be a scary thing. I just read a horrifying number and cannot not write about it although it certainly opens the door to political partisanship. The US has 743 prisoners per 100,000 inhabitants which is more than twice as much as the next country, France, at 365 per 100,000. 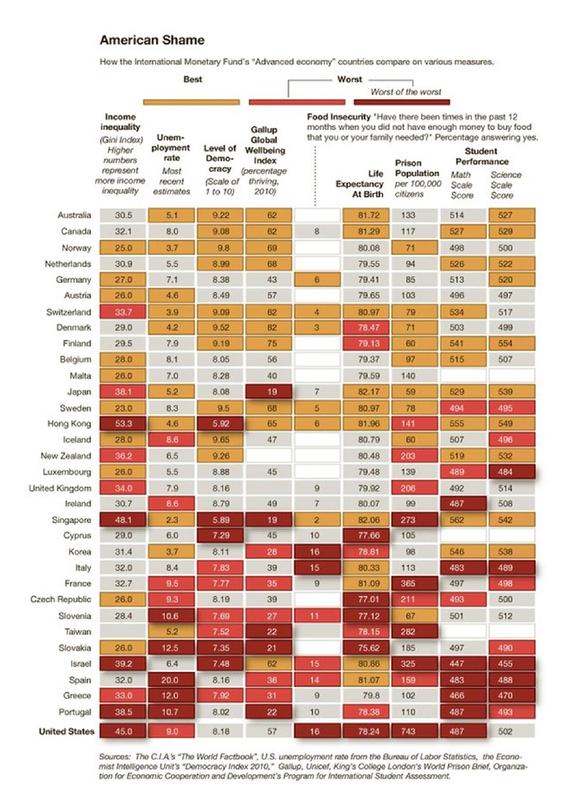 If we ignore the French for a bit (I know I shouldn’t say that as a German but let’s just do it anyway) the US has more prisoners per 100,000 inhabitants than the next three countries on that list put together (not all countries are on the list). The “list” was put together by the International Monetary Fund, an institution not know to be a bastion of radical leftish thinking. 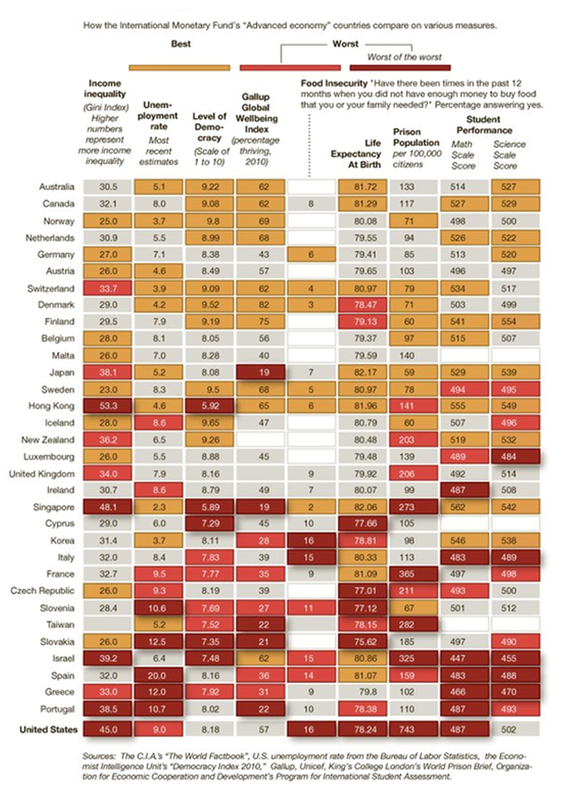 The entire table with other interesting data is included here. According to a blog I read (it is a subscription type of affair that’s why it doesn’t make sense to put the link here) the US is spending $15 billion every year to keep these people in jail. Which is a hell of a lot of money at a time where the Republicans want to cut funding for national Public Broadcasting which will save a whopping $445M. The Land of the Free sure seems to love its prisons. This is another funny sounding word whos meaning is anything but funny: gerrymandering. Gerrymandering is done in the context of elections and therefore, almost by definition, one will assume that it is something bad or borderline evil. And one would be right with that assumption as gerrymandering means the practice of redrawing electoral districts to gain an electoral advantage for a political party. In other words: if a party futzes around with the district boundaries in a way that secures them the victory in that district then they have been gerrymandering. The result of that practice are odd shaped districts and unfair elections. Gerrymandering in the US has quite a tradition: it was first reported in 1812 in Massachusetts. The governor of the state at the time, Mr. Gerry, bent and contorted the districts to secure the victory for his party (in this case the Democrats). One of the districts in Boston ended up so odd-shaped it resembled a salamander. And so the term was born. Unfortunately, gerrymandering has remained popular through the centuries and as recently as 2003 Tom DeLay in Texas gerrymandered the heck out of the congressional districts in Texas. The United States Supreme Court in 2006 thought that this was just dandy and ruled 7-2 in favor of practice. Ever wonder why people are so jaded about politics?